In most cases it is possible to distinguish immature from mature ducks and to tell males from females by their wings alone. In the Wood Duck, as in other ducks, the feathers of that year’s young are finer, more pointed and worn, and less colourful than those of adults. Females show a few small feathers on the upper surface of the wing that are purplish and have the same lustre as oil on water. These feathers are absent in males. The white tips on the feathers along the trailing edge of the wing are usually teardrop-shaped in the female, but either straight or V-shaped in the male. By studying the wings of ducks taken by hunters, biologists can determine the ratio of young to adult ducks in the population and thereby measure waterfowl production. 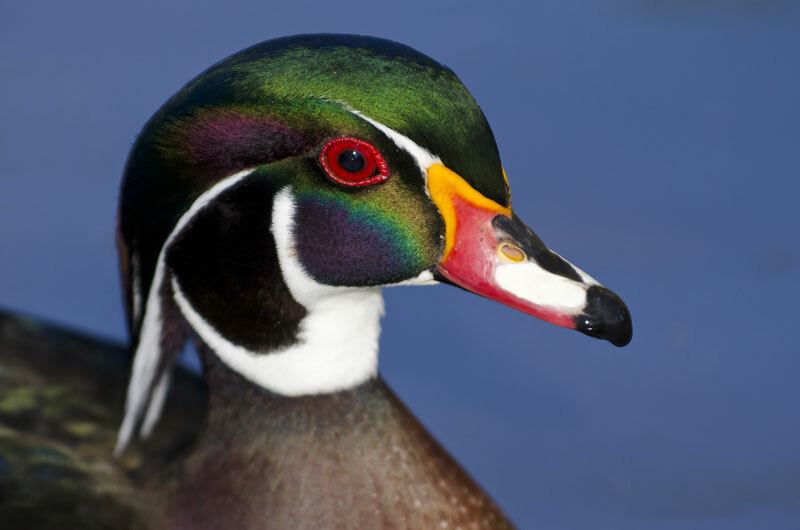 The Wood Duck is a distinctively North American species. Its only close relative is the Mandarin Duck of eastern Asia. Evidently the Wood Duck originated in North America, as fossil remains have been found only in widely scattered locations in the eastern part of the continent. 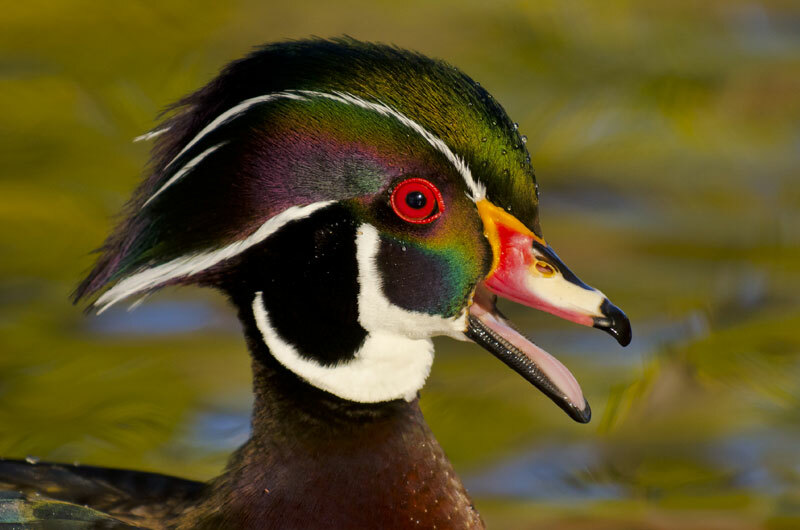 The male Wood Duck has two vocalizations: a loud distressed whoo-eek and a finchlike jeee, with rising inflection. The female’s sound is a crrek, crrek. 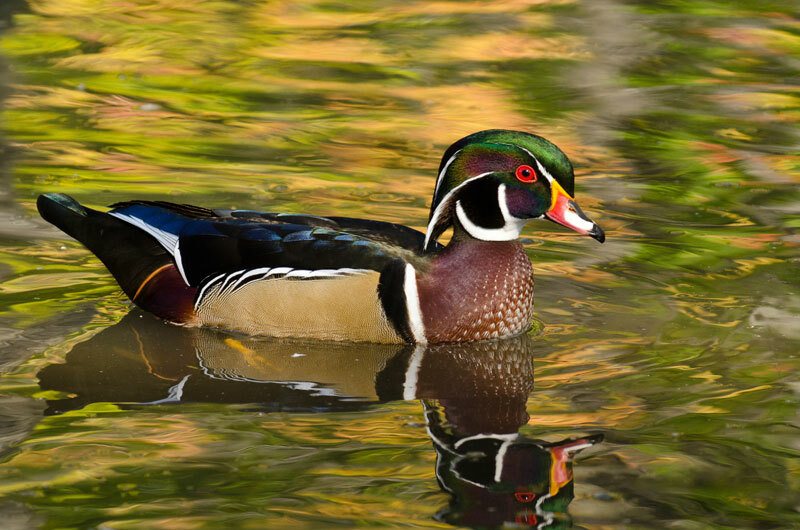 North American naturalists have traditionally grouped the Wood Duck with the Mallard and other common pond ducks as "dabblers," or "dabbling ducks." They recognize these as distinct from "divers" or "diving ducks" such as the Canvasback, based on both physical and behavioural differences. More recently, ornithologists, or bird experts, have placed the Wood Duck among the perching ducks rather than among the typical dabbling ducks. Although the Wood Duck feeds on the surface, as is typical of dabbling ducks, it appears to differ in other important respects. Its young are white below and dark above, unlike the typical yellowish ducklings of the dabblers, and they appear to have long tails when compared with other young dabblers. The adults perch, as do the Muscovy Duck and its relatives. 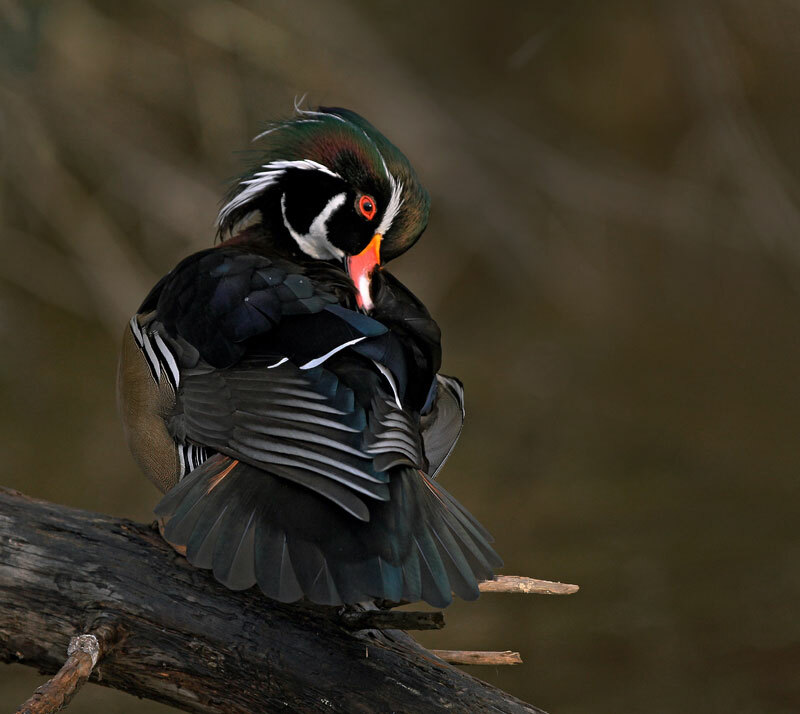 These and other considerations have led ornithologists, or bird experts, to place the Wood Duck among the perching ducks rather than among the typical dabbling ducks. The male Wood Duck in its multi-coloured breeding plumage, worn from October through June, is unexcelled among ducks. The female is less showy, although still beautiful and more colourful than other female ducks. 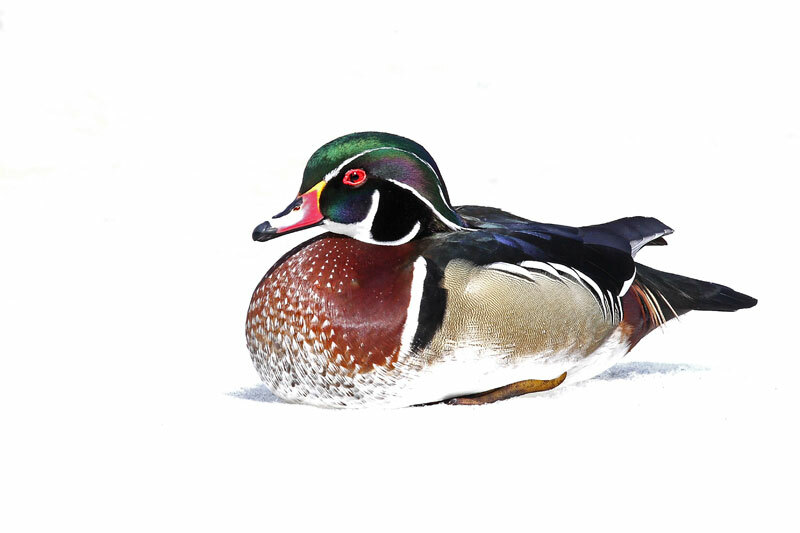 In Canada, the Wood Duck nests in scattered locations in the southern parts of all provinces; however, there is only one breeding record for Newfoundland and Labrador. The most extensive breeding ranges are in Ontario, Quebec, New Brunswick, and British Columbia. This duck occurs over a much wider area in late summer and early autumn, as a result of post-breeding dispersal. Although most Wood Ducks migrate to the United States, a few may spend the winter in extreme southern Ontario and southeastern British Columbia. 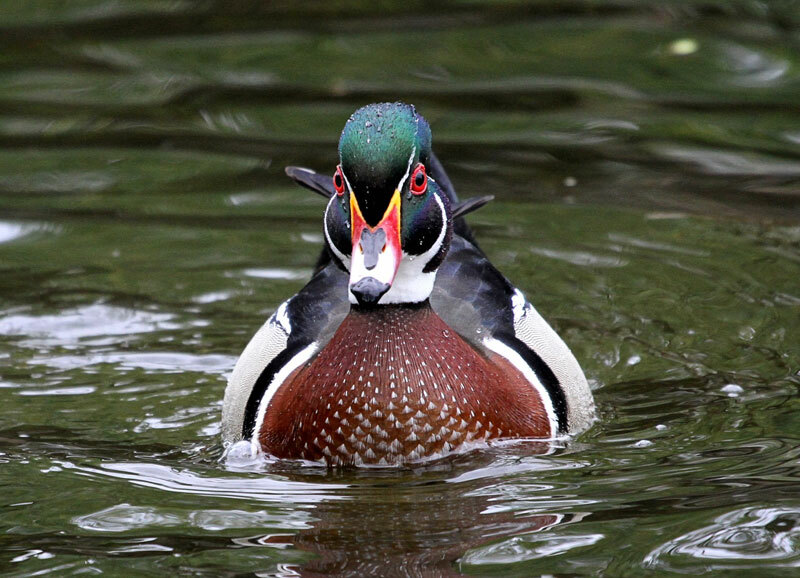 The Wood Duck is much more widely distributed in the United States, where it nests in areas east of the Mississippi River, along the lower Missouri River into South Dakota, in eastern Texas, along the Pacific coast, and in a few other places. It winters mainly along the Atlantic coast from New York south, along the Gulf coast into central Texas, to the lower Mississippi River valley and western California. A few winter in Mexico south to Distrito Federal. 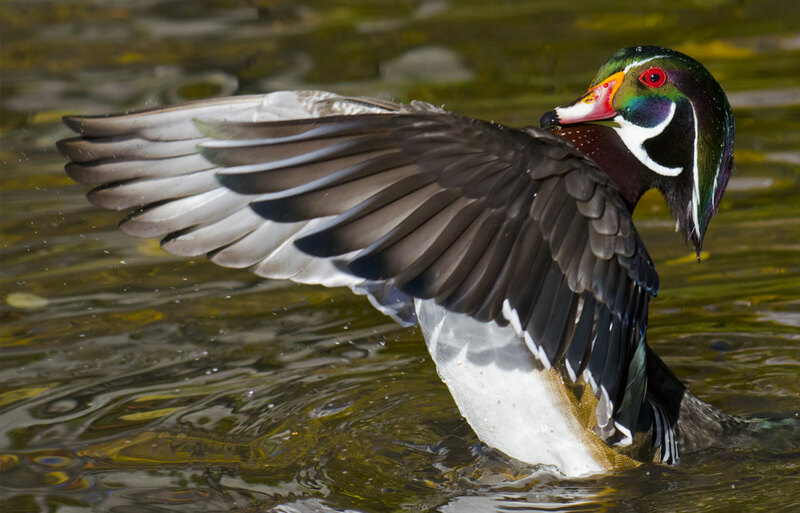 The Wood Duck is mainly a herbivore, or vegetarian, with plant foods making up about 90 percent of its diet. Foods vary according to their local availability, but duckweeds, cypress seeds, sedges, grasses, pondweeds, and acorns are among the more important foods throughout North America. In recent years corn has assumed a greater importance as small groups of Wood Ducks engage in field feeding behaviour similar to that of dabbling ducks, such as Mallards. Ducklings require a high protein diet for rapid growth. Invertebrates such as dragonflies, bugs, beetles, and spiders are important foods during the first few weeks of life, so high populations of these small creatures are essential in habitats where the young will hatch and develop. 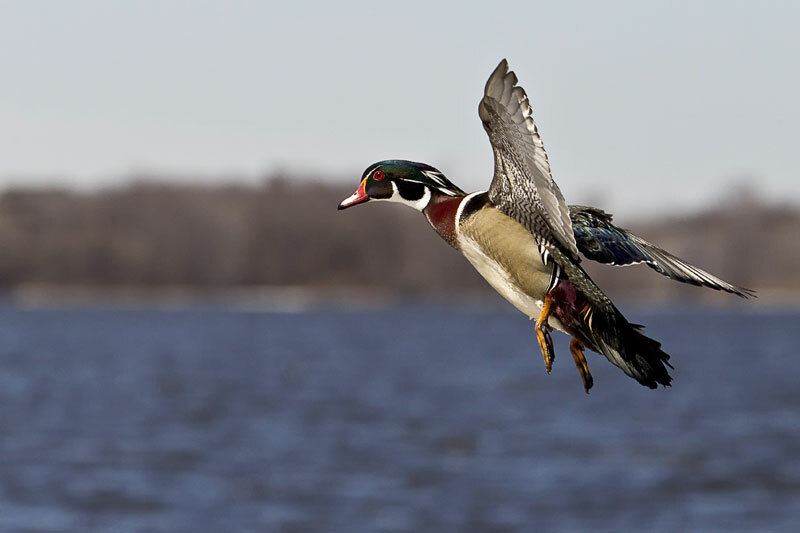 After a long winter in the relatively frost-free southern United States, Wood Ducks migrate north to their Canadian breeding grounds, arriving there by April. Pair formation may occur on the wintering grounds before or during spring migration, or on the breeding grounds if one of the pair is lost. Mated pairs seek out secluded swamps or beaver ponds that provide water, nesting sites, brooding habitat, and feeding areas. Females often return to the same general area in which they were hatched, sometimes accompanied by mates that were hatched far away. 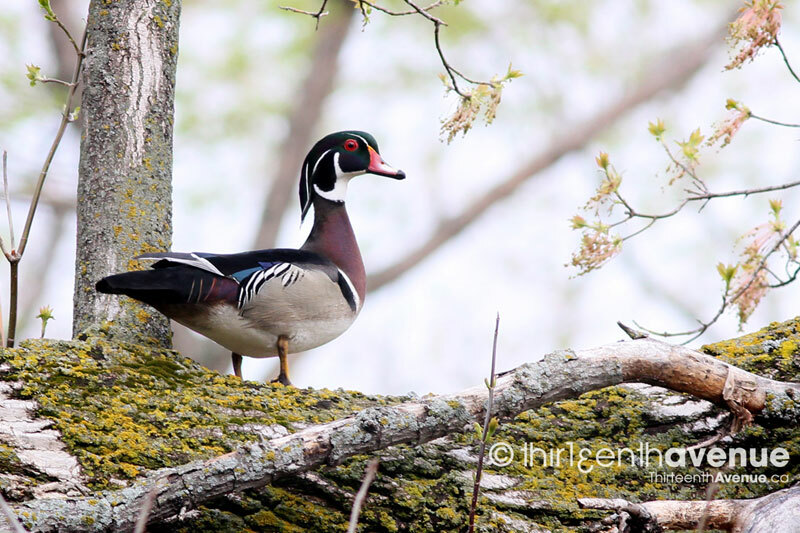 Like other perching ducks, Wood Ducks nest in trees. Preferred nesting sites are holes in hollow trunks or large branches that result from broken limbs, fire scars, lightning and logging damage. They also use cavities created by large woodpeckers such as the Pileated Woodpecker. Nests are situated from 1 to 15 m above ground, in trees more than 40 cm in diameter. They are usually found close to water, although females sometimes select trees some distance from water. The Wood Duck is not the only cavity-nesting duck found in Canada. The Common Goldeneye, Barrow’s Goldeneye, Bufflehead, and Hooded Merganser share this habit. 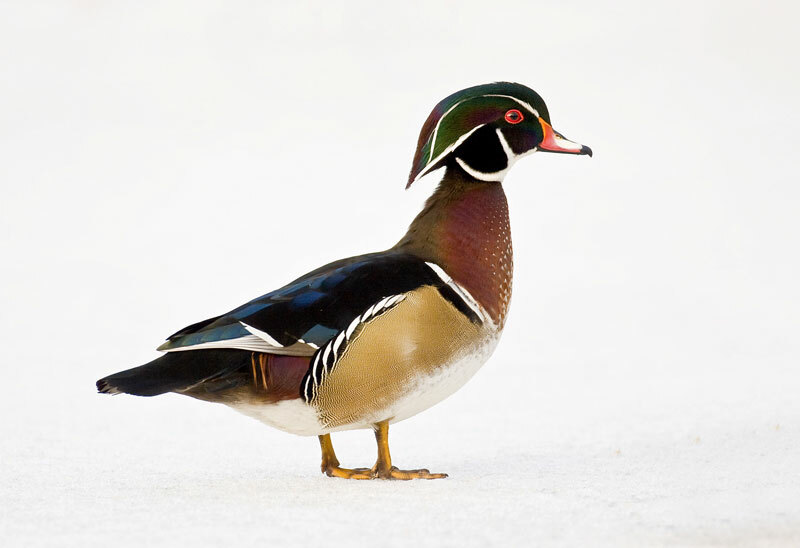 In some parts of Canada the breeding range of each of these species overlaps with that of the Wood Duck, resulting in some competition for nesting sites. However, differences in habitat and in the kind of nest site selected usually reduce this competition. 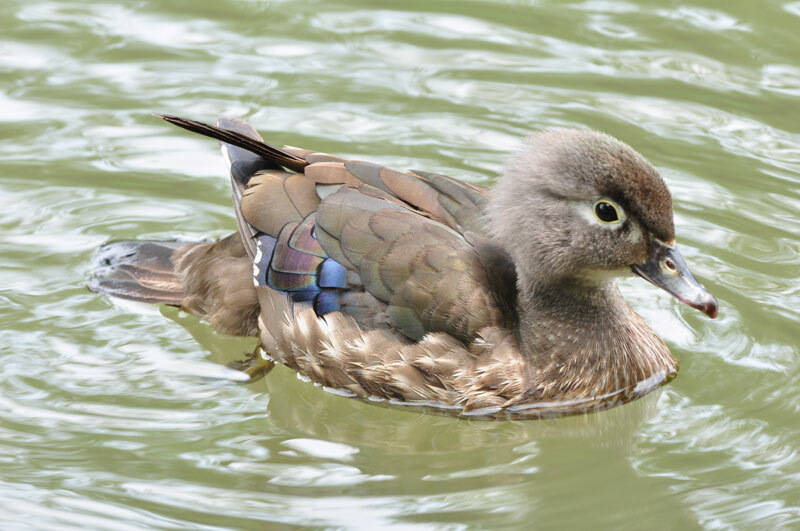 The female Wood Duck breeds when one year old. She lines the nest with down, or fine feathers, taken from her breast, and lays eight to 15 dull-white to cream-coloured eggs. She incubates, or keeps the eggs warm, for 28 to 30 days until they hatch. During unusually cold weather, or if the female is away from the nest for an abnormally long time, incubation may require a few extra days. Upon hatching, usually in June in eastern Canada, the young use their sharp claws to climb up the inside of the nesting cavity to its entrance, then jump and flutter to the ground, generally landing unharmed. The female guides them to the nearest water, where they will spend the next eight to nine weeks hunting for food together. Shortly after the female begins incubation the male loses interest in family affairs and spends more time away from the nest. He joins other males, which eventually form large groups. As mid-summer approaches, the males begin the move to remote, undisturbed, sheltered places to moult, or shed old feathers. 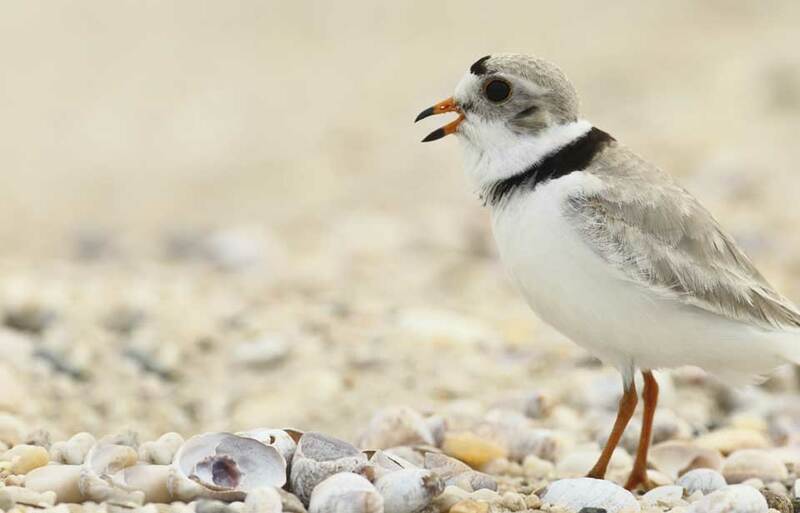 To reach these areas, they may travel great distances; many thousands migrate to southeastern Canada from breeding grounds in the northern states. On arrival the moult begins, and by August the brilliant spring feathers of the male have been replaced by a plumage similar to that of the female. Then, all at once, the flight feathers are moulted, leaving the male flightless for approximately four weeks while new feathers grow in. Soon after the ducklings have fledged, or taken their first flight, usually by mid-August in eastern Canada, the females leave their broods, move a short distance, and undergo their moult. Like the males, they too seek out remote, undisturbed swamps and marshes and become flightless for a short period. In late summer and early autumn, the young with their newly acquired powers of flight and the adults with their recently replaced flight feathers move in a leisurely way about the northern parts of their range. Their principal concern is to store up energy, in the form of fat, in preparation for the soon-to-come fall migration. 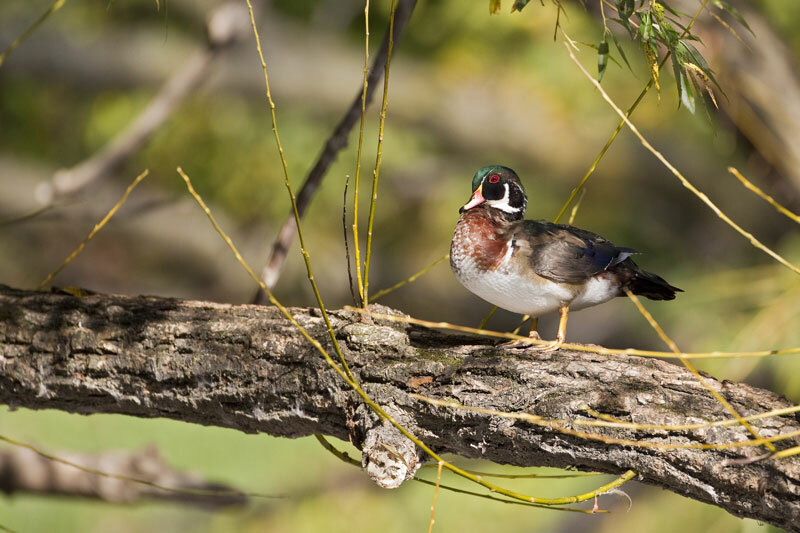 By the first severe frost, usually in late September or early October in eastern Canada, Wood Ducks begin to head for the southeastern United States. Southern populations of Wood Ducks, particularly females, are less migratory. Populations in the interior of British Columbia migrate to the west coast, whereas Wood Ducks that live on the coast do not migrate at all. When Europeans arrived in North America, they began to exploit the Wood Duck much more heavily than the Amerindians had done. Since that time, the Wood Duck has been a popular game duck, sought both for its flesh and its plumage. Hunting regulations were not effective in the early days of settlement, and by 1900 the Wood Duck had become scarce. In recognition of the need for protection, a total prohibition on hunting was enforced between 1918 and 1941. This joint effort was made possible by the Migratory Birds Convention of 1916 between Great Britain (on behalf of Canada) and the United States. 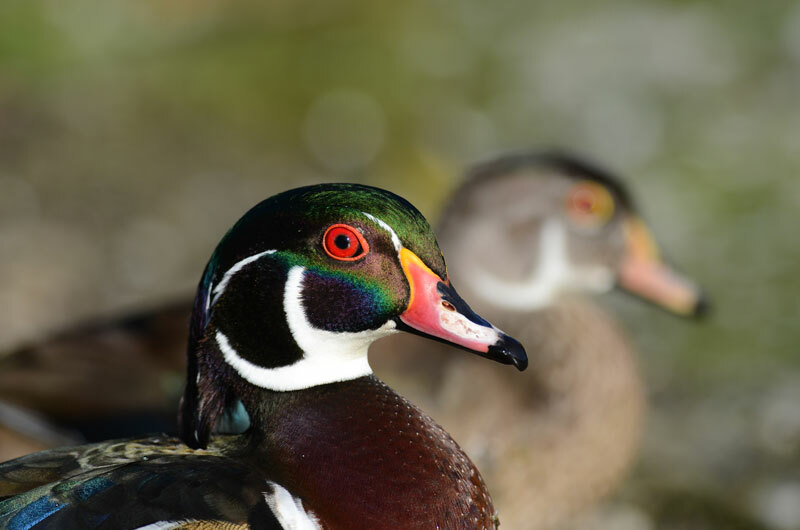 As Wood Duck numbers have continued to grow following this protection, there have been increasingly liberal Wood Duck regulations since 1941. An average of 1 189 000 Wood Ducks were taken by North American hunters annually between 1972 and 1989—121 000 in Canada and 1 068 000 in the United States. 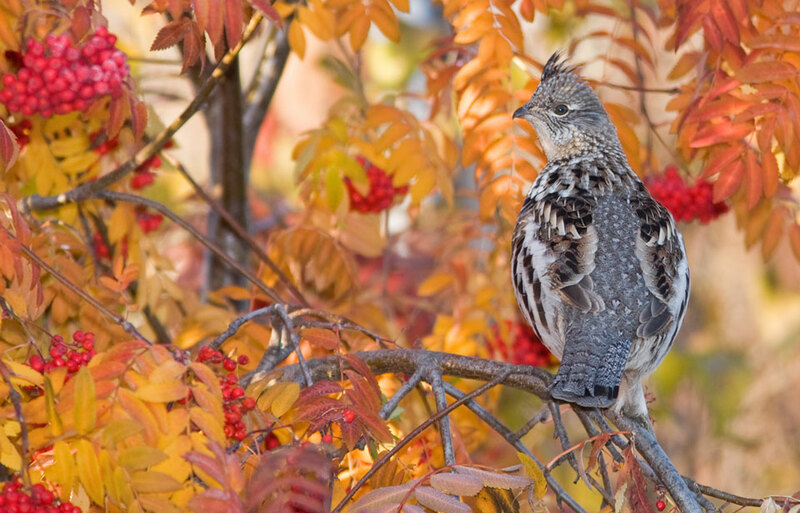 Continental populations are estimated to be between two million and four million birds at the end of the American hunting season; this species is thus in a relatively secure position at present. 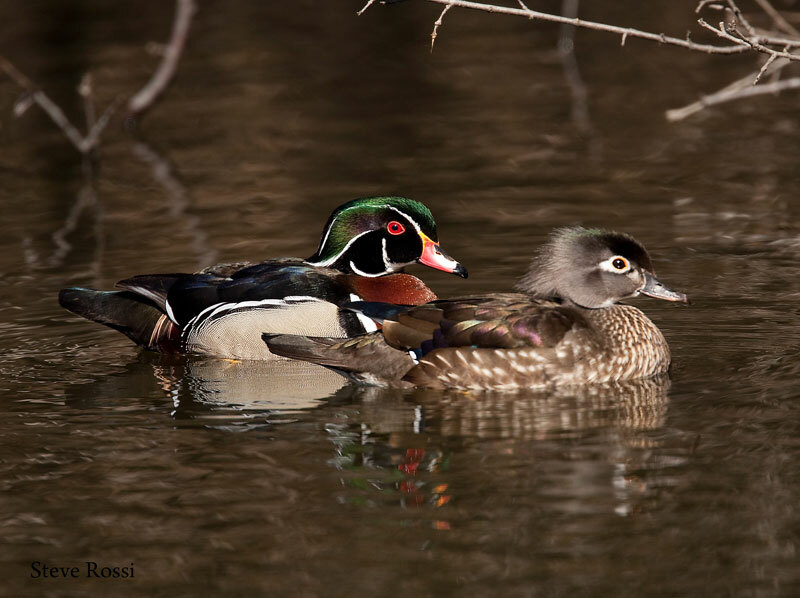 Wood Duck populations are limited by the availability and quality of habitat. People are the most important cause of mortality, chiefly by hunting; other mortality agents include nest predation by raccoons and bull snakes, disease, and parasites. 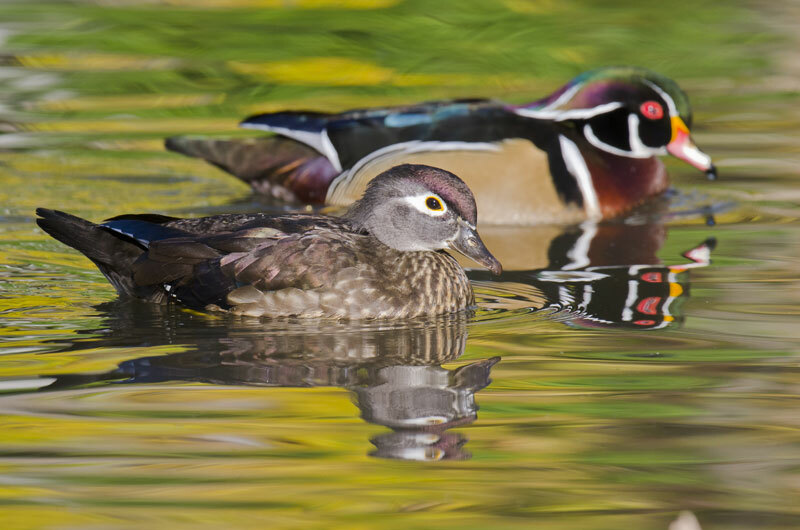 Disease and parasites are not usually important causes of death, although diseases such as duck malaria and duck viral enteritis are known to affect Wood Ducks. Wood Duck nests located in natural cavities or in well-protected artificial nest boxes have a higher hatching success than most duck nests. The Wood Duck, being a tree-nester, can easily be induced to nest in artificial nesting boxes, many types of which have proved successful. The Canadian Wildlife Service recommends that nest boxes be at least 55 cm deep and 25 cm wide, with elliptical entrances of no more than 7.5 by 10 cm to reduce nest predation by raccoons. Raccoon predation on clutches within artificial nest boxes can also be reduced by placing boxes on posts or poles over deep water or wrapping sheet metal around the tree or post supporting the box. Starlings must also be discouraged from taking over the Wood Duck nesting boxes by making the entrance larger than they prefer. For optimum production it is important to maintain nest boxes on an annual basis. Maintenance should include replacement of shavings and ensuring that the box is sound and securely supported. 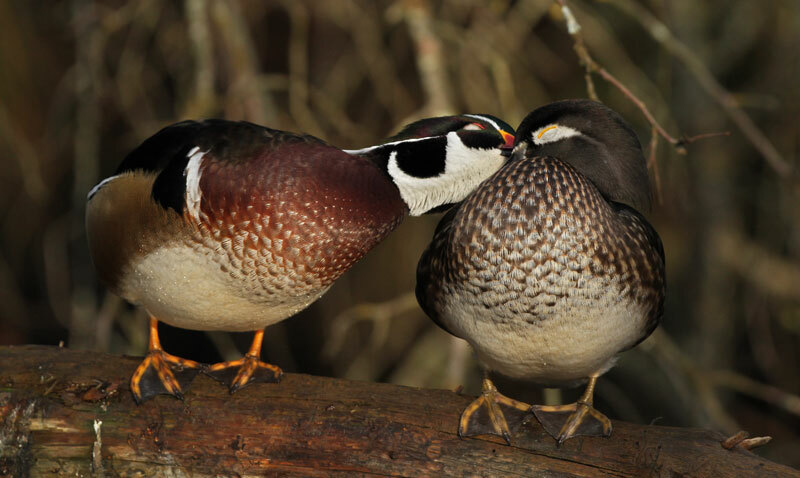 Although nest box programs can be very effective in increasing local breeding populations, the total population of Wood Ducks depends greatly on natural conditions. 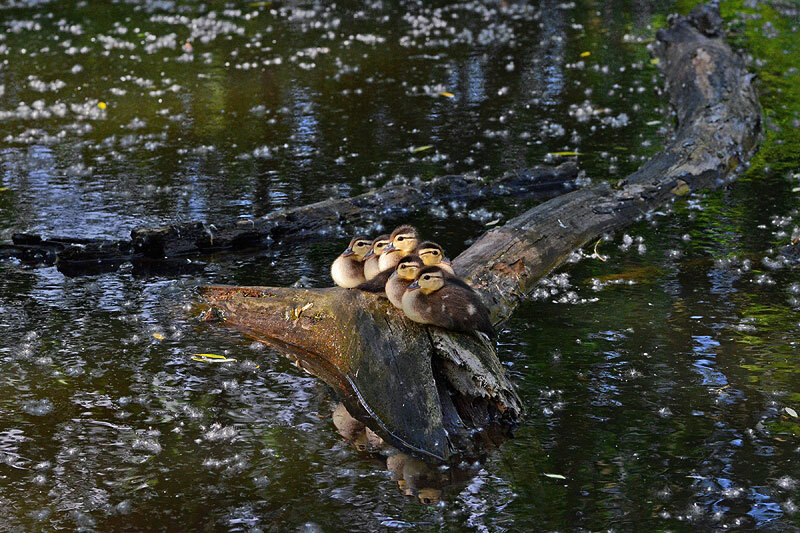 Federal, provincial, and state wildlife agencies can provide an abundance of the habitat essential to Wood Duck survival by maintaining over-mature trees in nesting areas, controlling pesticides, and preserving wetlands, particularly wooded swamps. When combined with hunting regulations based on reliable population estimates, these management policies ensure that Wood Ducks continue to be a source of enjoyment and a valuable resource in North America. Bent, A.C. 1923. Life histories of North American wild fowl. Part I. Reprinted 1987 by Dover Press. Fredrickson, L.H., G.V. Burger, S.P. Havera, D.A. Graber, R.E. Kirby, and T.S. Taylor, editors. 1990. 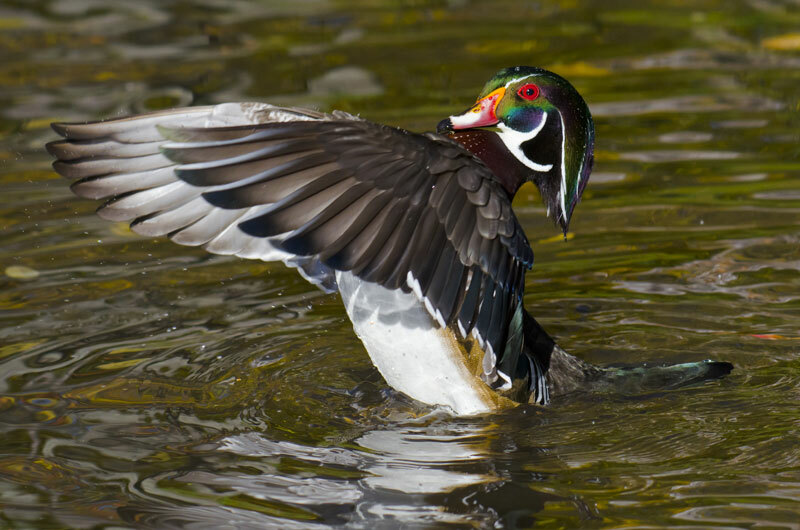 Proceedings of the North American Wood Duck Symposium. St. Louis, Missouri.